The first night of week five and it is the warm-up before warm-up week. That means there is a fortnight until official OzTAM 2018 survey starts and networks want to get some momentum they hope will carry through into the survey weeks. With the year featuring some major sporting events in the first few months, getting momentum whenever and whereever you can will be crucial. The channel and the network dominated the start of the unofficial ratings year. However, the numbers weren’t quite as big as last year when it comes to measuring traditional TV viewing. 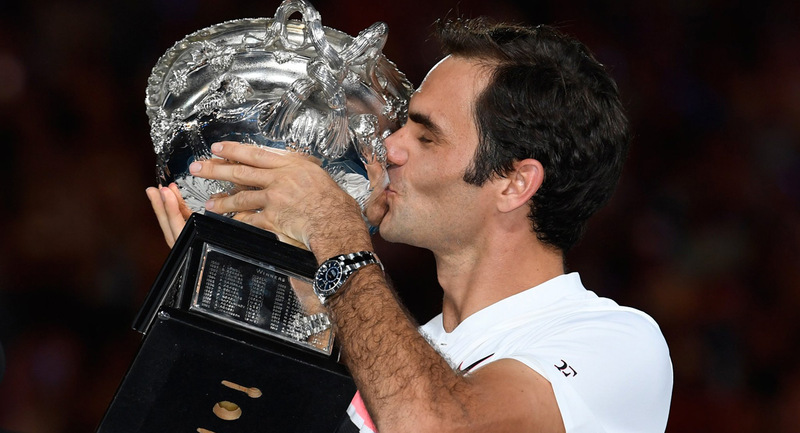 The 2017 Australian Open men’s final did 2.66m compared to last night’s 1.73m. The digital audience watching the final day of the tournament consumed 10.6m streaming minutes, which was up 5% on the same day last year. 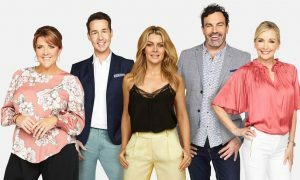 Seven’s metro TV share was down year-on-year for the same night. In 2017 that number was a massive primary share of 50.6% and a network share of 54.5%. 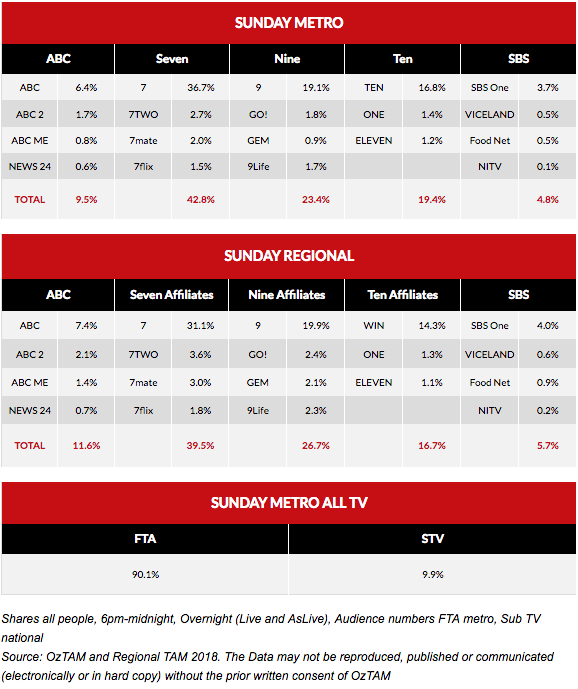 Last night the metro primary share was 36.7% with a combined channel network share of 42.8%. The final One Day International between Australia and England saw Australia crumble as they failed to reach what was a modest target. The audience for both sessions from the new Perth Stadium was just under 1m. Nine did grow its share on this night last year though – primary share climbed from 12.4% to 19.1% YOY. 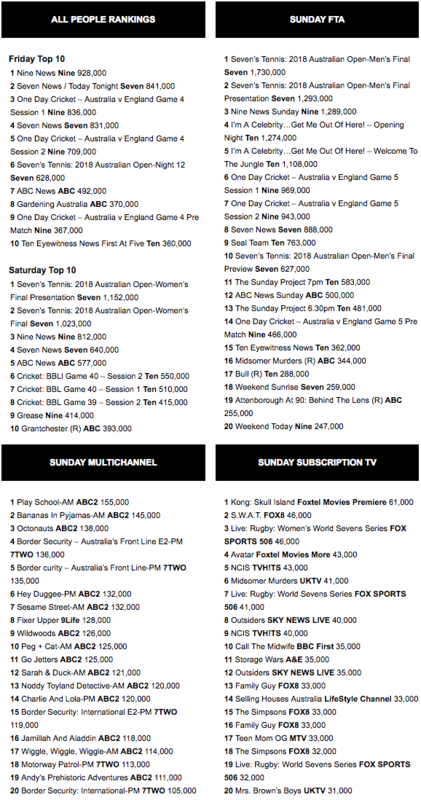 Although Seven and Nine had international live sporting events filling much of primetime, earlier in the night there was lots of interest in Lisa Wilkinson‘s debut on Network Ten and The Project. Wilkinson’s colleagues on her first appearance on the Sunday edition of the daily current affairs show were Pete Helliar, Hamish Macdonald and Rachel Corbett. The big guest was Jessica Chastain who is in Australia promoting Molly’s Game. The first 30 minutes of The Project at 6.30pm was not up against news bulletins for a change with Seven and Nine both returning to their respective sporting events. The Project did 587,000 after 7pm, which was the biggest audience ever for the Sunday edition of the show. The average across the hour was 536,000, with 481,000 at 6.30pm. The launch of I’m A Celebrity…Get Me Out Of Here performed very strongly given the competition it always faces at the start of each series. The show was divided into two segments for the ratings – Opening Night did 1.25m, which was up 14% YOY. Welcome To The Jungle did 1.11m, which was up 15% YOY. Following the celebrities was the premiere of the new CBS drama Seal Team. The corrected figure for the launch episode was 483,000, which isn’t a bad number for a US drama (if we don’t include the numbers for The Good Doctor).